Discussion in 'Retro & Arcade' started by elvis, Dec 1, 2017. (Click here to find out why we're playing these old games). It's unlikely Doom needs much introduction on a PC enthusiast website. iD Software (later lower-casing their title to "id Software") and their super developer John Carmack had earlier given us titles like the "Catacomb 3-D" titles (which we did as our very first "Let's Play") and the smash hit "Wolfenstein 3D". 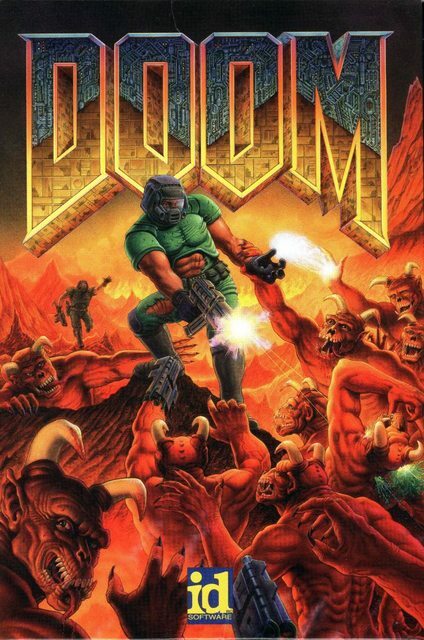 Doom took the development of PC-based 3D engines a step further, breaking free from limitations such as 90 degree walls, and only a single height floor within a map, producing complex areas for players to progress through. The "id Tech 1" engine would go on to power a number of other prominent games over the following years, including further hits such as Heretic and Hexen. Doom also provided us with the quintessential "Space Marine" character, now a famous staple in many sci-fi first person shooters. Our main character, clad in green suit and full face helmet, is posted on a military base on Mars where an organisation is conducting experiments in teleportation between the Martian moons. Something goes terribly, terribly wrong (doesn't it always? ), and suddenly the hoards of hell begin pouring out of the teleportation gateway. Our well trained "Doomguy" must don an arsenal of weapons, and blast everything in sight. Doom also introduced a generation of gamers to network multiplayer, both co-operative and "deathmatch". This extended the life of the game well beyond the single player story, allowing up to 4 people on 4 computers to connect on a local area network and battle each other head to head, real time, each with their own viewpoint - Something largely taken for granted in modern gaming, but at the time consider revolutionary. Along with head developer Carmack, Doom brought great attention to John Romero. Romero's design influence saw the horror themes come to the fore, and in a world long before R-rated game classifications and Mortal Kombats, saw Doom attract a lot of attention for it's "realistic" portrayals of violence, horror and gore. Doom caused a lot of controversy, and was frequently used by politicians as the root cause of youth violence. Many countries banned the game for sale for periods of time. Doom continued with the concept of "Shareware", popular for titles of the time. This allowed the first episode of the game to be shared for free, relying on people copying 3.5" 1.44MB flopppy disks to pass on the game. On start and exit of the game, "nag screens" would be shown telling the player where they could post their money order to purchase the full game (for the younger readers, yes, there was a time before the Internet) allowing them to have the game floppies posted back. Doom also made community modification (or mods) easy to do, which extended the popularity and life of the game even further. Packs could be downloaded and added to the game, offering new maps, weapons, or graphical overhauls to tweak the existing game, create new content, or build entirely new games within the engine. darknebula, Rubberband, breno and 4 others like this. You might be interested in this, guy was from our TF2 forums and he reaaaaallly likes Doom. Bunch of interesting commentary too. It didn't link the playlist properly, but there are more. speaking of Doom, aussie youtuber Gggmanlives has heaps of coverage of different doom mods/wads on his channel that he reviews. bennyg, adz and elvis like this. "Brutal Doom" is certainly an accurate title. I'm really impressed at how much it adds to the game. I've played a fair few mods in my time, but that one is one of the most impressive. The additional metal soundtrack add-on from modb really uplifts Brutal Doom’s non stop action atmosphere. This is one of those games that I will never stop going back to. For me it's a timeless classic of which I couldn't even guess the hours spent on the original game let alone the total conversions, maps, graphics and sound wads floating around the web. I used to keep an archive copy of idgames ftp to play/mod/create and between Doom and Duke 3D this occupied a lot of my time in the 90s. For those who can't handle the old school graphics and low res then try a modern port such as GZDoom there are many other ports available but that's the one I tend to use unless a mod specifically requires features of a particular engine. There's replacement audio for the midi such as here or Doom Metal soundtrack as mentioned. You can also install Hi Res Texture Packs, there have also been 3d models created but for me I prefer the original sprites. Also, absolutely everyone should play the Doom 3 mod, "Classic Doom" - it recreates the first shareware quarter of Doom in the Doom 3 engine, and in doing so, brings back those feelings of what it was like to actually play doom1 in the early '90's - no mean feat. kesawi and elvis like this. It didn't make my OCAU top 10 retro list because I just played way more Quake during my high school years, but I recently started playing through it again after I got it on steam and I realised that Doom 1/2 are still some of my favourite games of all time, its amazing how much of a great feeling it still is to play these games and also well you remember some maps even after all this time. Thanks for the link! I was excited to try this out but then I realised I only have Doom3BFG edition on steam which apparently does not support these mods A quick search on google gives me the idea that you can convert Doom3 mods to work with BFG edition but I haven't made any progress yet. Any ideas on this one or does anyone have it working with BFG edition? The shareware version technically only contained the first third of the game, as the original release only had 3 episodes. It wasn't until 'The Ultimate DOOM' that the fourth episode was available, and AFAIK there wasn't an updated shareware release that mentioned the new episode. DOOM is more than software in my mind, it's a magic and unrepeatable phenomena. Reading "Masters of DOOM" confirmed it - the right mix of talent / personalities / technologies, and the time was right. Not even ID could do it again IMO; even a couple of years later with Quake it was a totally different result. I replay the original often on period hardware and it still blows my mind. Cheers. Changed "level" to "episode". the right mix of talent / personalities / technologies, and the time was right. Most successes come down to timing. Nobody could make a Microsoft Windows again. Nobody could make an iPod again. Consider that Apple failed miserably with the Apple Newton, only to find great success with the iPad, simply because the timing was right the second time around. Even just being the first to market is less important than getting the exact timing right (just ask Sega). It's easy to put anyone who finds success on a pedestal as some sort of amazing exception, but the truth is timing and market readiness is as important as anything else. I was going to mention that book Masters of Doom.. A great read for any doom fan or gamer alike. Golly gosh, Brutal doom, is well brutal. Some of the levels I played I couldn't find things like switches, because there was so much blood and disembodied meat. I am fond of the ultra-violence as the next mal-adjusted gen x-er, but jeepers, its just wall to wall carnage, it takes a bit away from the puzzle and maze aspect of doom, and makes every new room a killing spree and takes away some of the suspense and foreboding as you never seem to drop out of the gore fest, after you kill everything your literally sliding around on the blood trying to work out where the doors were/are. Barreled through the first episode on the weekend, it was kinda of depressing watching the 'secrets' percentage drop after each level, I used to pride myself in being able to find them all. First game I purchased myself. Preferred Doom2 to be honest, and Quake1/2 still. Doom3 was a miss, but new Doom brought it all back. gonna have to go fire up Doom again tonight. Same, but you'd almost consider Doom 2 just a bunch of extended levels. Probably closer to "DLC" in modern language. The engine didn't bring any modifications, and all we got as extra was the double shotgun. Yeah but that alone made the whole thing worth it! One of my favourite FPS weapons ever. I thought they ID lost the plot a bit with Quake, great tech great engine but crappy dull colours never really captured the imagination like Wolf3D or Doom. The colours were vibrant in those games but they made a return in Quake 3, they really dropped the ball IMO look at Duke3D or Half Life I bet most people prefer those games over Quake or Quake 2.